If I can, I always try to see Def Leppard in Sheffield, when they are playing at home (well, three of them at least). The city has always been proud of its boys, and always gives them a great welcome. Me, I remember seeing them down at our local nightclub, The Porterhouse, where they used to play nearly every other week. I was there on the night they got signed by Mercury Records and the success story started right there. Who would have thought at that time that they would have become so, so big? Before seeing how big they had become though, we had a set by Cheap Trick. 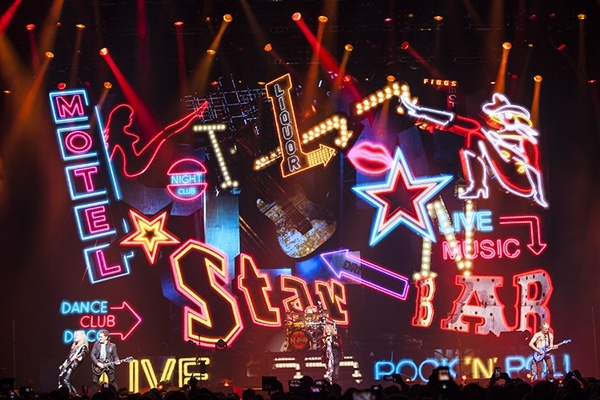 This was the first time I had ever seen them live, and apart from their really well known songs, the only thing I knew about them was their guitarist Rick Nielsen with his baseball cap and his collection of crazy guitars. 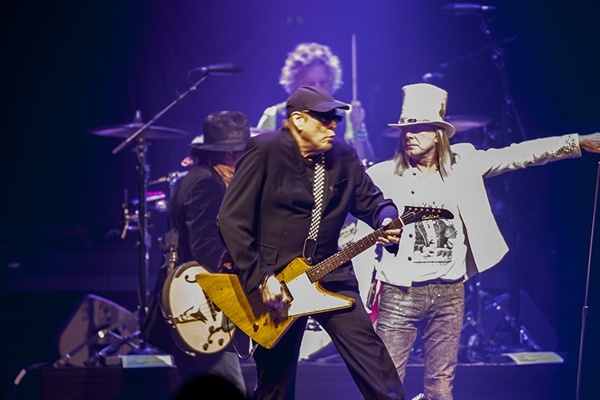 Arriving on stage, vocalist Robin Zander was bedecked in a white jacket and top hat, looking like the MC of a weird carnival. As they played, they really surprised me by doing The Move's 'California Man', only to be followed by two other covers, namely Fats Domino's 'Ain't That A Shame' and Velvet Underground's 'I'm Waiting For The Man'. I know they are fairly well known, but I would have thought they would have done more of their own material. Sure enough though, towards the end they played 'I Want You To Want Me', which got everybody going, and 'Surrender', which was the second of their really well known songs that I mentioned earlier. Set list:- Hello There, Big Eyes, California Man (The Move), If You Want My Love, Ain't That A Shame (Fats Domino), I'm Waiting For The Man (Velvet Underground), I Want You To Want Me, Dream Police, Surrender, Goodnight Now. Almost as soon as Cheap Trick had gone off, we got an announcement that Def Leppard would be on in thirty minutes, and the three screens high above, which covered the whole width of the stage, came right down, and commenced the countdown. Naturally, the place was packed out, and the reception they received when they arrived was huge, and totally expected. Very quickly, the light show kicked in, and I have to say, impressive is not the word, the three screens having gone back up and now brightly displaying the name "Sheffield". 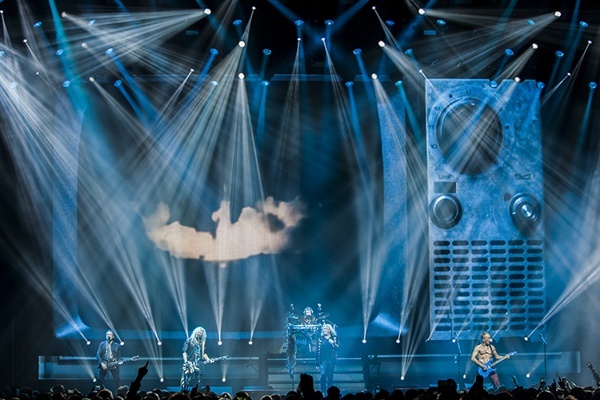 The jaunt was advertised as "The Hysteria Tour" where the album would be played in its entirety, something which they had never done before. And that is exactly what they did, in the correct order. This album, of course, had the songs 'Women', 'Rocket,', 'Animal', 'Love Bites' (which saw the light show augmented by lasers), 'Pour Some Sugar On Me', 'Armageddon It' (after which Joe Elliott explained that they had been voted into the Rock & Roll Hall Of Fame, and thanked the fans for voting for them. 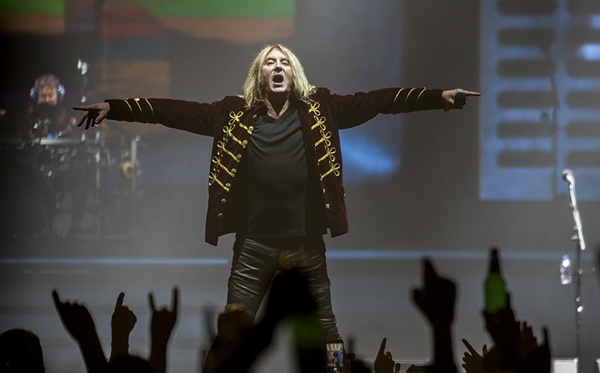 He also said that anybody who was involved in the band, including original guitarist Pete Willis and Steve Clark's mum, who was in the audience tonight, would all be there), and 'Hysteria' itself, which were all massive hit singles for the band, turning them into superstars. There was a little tribute to David Bowie with the band slipping the chorus to 'Heroes' in towards the end of 'Hysteria', which was again applauded by the audience. And generally speaking, it was a very impressive show, but there were a couple of things that niggled a little. 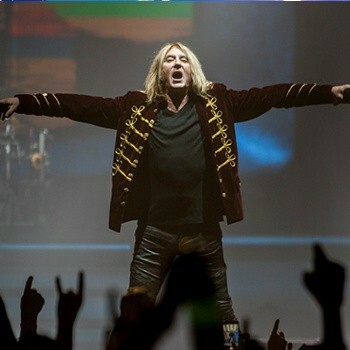 It may have been me, but I thought Joe Elliott sang falsetto just a tad too much. And it may have been where I was sat, but the sound was a bit woolley and bass heavy which at times made the vocals and the guitar leads a little indistinct. It was good again to see respects paid to the late Steve Clark, something which the audience really appreciated. The end of the 'Hysteria' songs heralded the end of the main set, but it wasn't long before they came back on, having had a change of clothes (all apart from shirtless Phil Collen of course), to do another five songs, before saying their farewells and promising they will be back to do it again. As I said earlier, this band is still big, and they certainly showed how to put on a spectacular show. To a large degree, you could have called this concert a "best of", or a "greatest hits" show, the fact that seven of them all came from one album is irrelevant. And if you missed this set of dates but wanted to see them, don't forget that they headline one of the nights at Download next year, which gives them scope to make it even bigger. 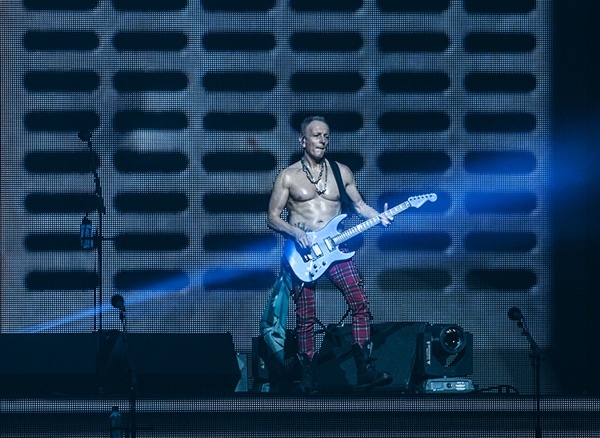 Set list:- Women, Rocket, Animal, Love Bites, Pour Some Sugar On Me, Armageddon It, Gods Of War, Don't Shoot Shotgun, Run Riot, Hysteria, Excitable, Love And Affection. Encore: Wasted, When Love And Hate Collide, Let's Get Rocked, Rock Of Ages, Photograph.